A railroad linking America's east and west coasts had been a dream almost since the steam locomotive made its first appearance in the early 1830s. The need for such a link was dramatized by the discovery of gold in California in 1848 that brought thousands to the West Coast. At that time only two routes to the West were available: by wagon across the plains or by ship around South America. Traveling either of these could take four months or more to complete. favored a northern route while the Southern states pushed for a southern route. 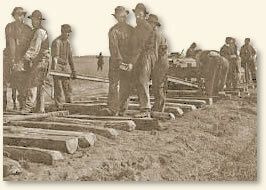 This log jam was broken in 1861 with the secession of the Southern states from the Union that allowed Congress to select a route running through Nebraska to California. Construction of the railroad presented a daunting task requiring the laying of over 2000 miles of track that stretched through some the most forbidding landscape on the continent. Tunnels would have to be blasted out of the mountains, rivers bridged and wilderness tamed. Two railroad companies took up the challenge. The Union Pacific began laying track from Omaha to the west while the Central Pacific headed east from Sacramento. Progress was slow initially, but the pace quickened with the end of the Civil War. Finally the two sets of railroad tracks were joined and the continent united with elaborate ceremony at Promontory, Utah on May 10, 1869. The impact was immediate and dramatic. Travel time between America's east and west coasts was reduced from months to less than a week. 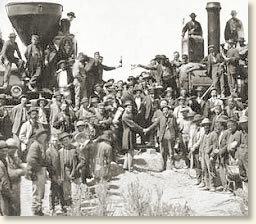 "It was a very hilarious occasion; everybody had all they wanted to drink..."
The ceremony at Promontory culminated with Governor Stanford of California (representing the Central Pacific Railroad) and Thomas Durant (president of the Union Pacific Railroad) taking turns pounding a Golden Spike into the final tie that united the railroad's east and west sections. As the spike was struck, telegraph signals simultaneously alerted San Francisco and New York City, igniting a celebratory cacophony of tolling bells and cannon fire in each city. On the last day, only about 100 feet were laid, and everybody tried to have a hand in the work. I took a shovel from an Irishman, and threw a shovel full of dirt on the ties just to tell about it afterward. A special train from the west brought Sidney Dillon, General Dodge, T. C. Durant, John R. Duff, S. A. Seymour, a lot of newspaper men, and plenty of the best brands of champagne. Another train made up at Ogden carried the band from Fort Douglas, the leading men of Utah Territory, and a small but efficient supply of Valley Tan. It was a very hilarious occasion; everybody had all they wanted to drink all the time. Some of the participants got "sloppy," and these were not all Irish and Chinese by any means. California furnished the Golden Spike. Governor Tuttle of Nevada furnished one of silver. General Stanford [Governor Safford?] presented one of gold, silver, and iron from Arizona. The last tie was of California laurel. When they came to drive the last spike, Governor Stanford, president of the Central Pacific, took the sledge, and the first time he struck he missed the spike and hit the rail. It was a great occasion, everyone carried off souvenirs and there are enough splinters of the last tie in museums to make a good bonfire. When the connection was finally made the Union Pacific and the Central Pacific engineers ran their engines up until their pilots touched. Then the engineers shook hands and had their pictures taken and each broke a bottle of champagne on the pilot of the other's engine and had their picture taken again. The Union Pacific engine, the, 'Jupiter,' was driven by my good friend, George Lashus, who still lives in Ogden. Both before and after the spike driving ceremony there were speeches, which were cheered heartily. I do not remember what any of the speakers said now, but I do remember that there was a great abundance of champagne." Alexander Topence's account first appeared in Topence, Alexander, Alexander Topence, Pioneer (1923) republished in Botkin, B.A. and Alvin Harlow (eds.) A Treasury of Railroad Folklore (1953); Bain, David Harward, Empire Express, Building the First Transcontinental Railroad (1999). "Completing the Transcontinental Railroad, 1869" EyeWitness to History, www.eyewitnesstohistory.com (2004). In June 1876 the Transcontinental Express set a record of 83 hours and 39 minutes to make the trip from New York City to San Francisco.